Help Durham Wildlife Trust make Low Barns a more enjoyable and accessible place for all. We have secured funding to start improvement work but estimate that we need to raise a further £30,000. For over 50 years Low Barns has provided a place where people can connect with nature. Today, perhaps more than ever, we recognise how important that connection is. The natural world is good for the body and good for the soul, but the opportunity to experience and enjoy wildlife is something that we all find harder to fit into our busy modern lives. Children and young people in particular are losing their connection with nature, with wildlife not only lost from the school curriculum but from everyday language – kingfishers are no longer thought to deserve a place in the Oxford Junior Dictionary. 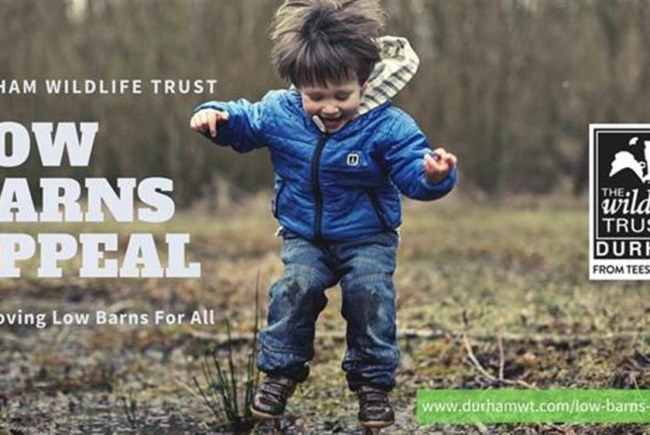 Durham Wildlife Trust wants to make sure that Low Barns not only continues to provide a place to connect with nature, but provides greater opportunities for children and adults to be inspired by the natural world. To do that we need your support to make sure Low Barns Visitor Centre is ready for the next 50 years. By improving the facilities on offer the Trust can attract a new audience. Create a community space that can be used by all - school groups, companies, mother and baby groups etc. Thanks to funding from North Pennine Dales LEADER and the Weardale Area Action Partnership (AAP) the Low Barns Visitor Centre will be undergoing a major refurbishment this spring. Zoe Hull, The Trust’s Head of Operations and Development said, ‘’Low Barns is a magical place, but the Centre was beginning to look a little tired so this investment from LEADER and the AAP is great news for the Trust and visitors to Low Barns .’’ The car park will be redesigned so that vehicles will no longer drive around the building, but the number of parking spaces will remain the same. This will make the site safer for pedestrians and allow the creation of a larger outdoor seating area with views across Marston Lake. Larger glass doors will be fitted to open up the indoor space and connect it to the new outdoor seating area. The shop and serving area will be refitted and improved. The existing offices will be converted into a new meeting and exhibition space. Durham Wildlife Trust is an independent charity and limited company that was established in 1971, originally as the Durham County Conservation Trust, becoming Durham Wildlife Trust is 1988. Durham Wildlife Trust is part of the federation of 47 organisations that together form the Wildlife Trusts. Each organisation is an independent charity but with shared aims and badger logo branding. The Trusts are membership organisations. When DWT was established the county of Durham extended from the rivers Tees to Tyne across an area administered by Durham County Council. Subsequent local government reorganisation reduced the area of County Durham and created Tyne and Wear and Cleveland. As a result, DWT today covers County Durham, the southern boroughs of Tyne and Wear – Gateshead, South Tyneside and Sunderland – and Darlington. In 2015, to clarify the geographical area of operations of the Trust, the phrase From Tees to Tyne was added to the DWT logo. As a small, local charity we rely on the support of our members. Membership enables us to manage our nature reserves, run conservation projects, deliver environmental education activities and provide thousands of volunteering opportunities each year. Across County Durham, Darlington, Gateshead, South Tyneside and Sunderland no one is working harder to protect our wildlife for future generations. Project Delivery Manager: Durham Wildlife Trust The Project Delivery Manager takes legal responsibility for receiving and spending the funds raised and ensuring the project is delivered.